Replacement or installation of Turcite ways or Rulon ways available Liner ways replacement. 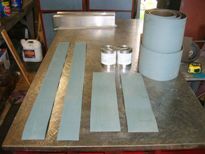 Rulon is a blue green liner bearing material made of specially compounded forms of fluoropolymer and other plastic resins, with a light dusting of bronzes. Rulon has a good stability characteristics and mechanical properties, less friction, vibration dampening and long life if maintain properly. One set of replacement ways ready for sale.